The Caribbean and the United Kingdom (UK) have opened talks on ensuring seamless continuation of trade between the two sides continues after Britain exits the European Union, Caribbean Community (Caricom) Secretary General, Irwin La Rocque said Thursday. He said a Caribbean trade ministerial meeting in Guyana would examine proposals to ensure trade between the region and the UK is not disrupted. “Trade between the Region and the UK is currently governed by the provisions of the Economic Partnership Agreement with the EU. Both parties have begun preliminary consultations towards ensuring that there will be no interruption in our trade post Brexit. The Council will examine proposals for advancing the technical work in that regard,” La Rocque said. 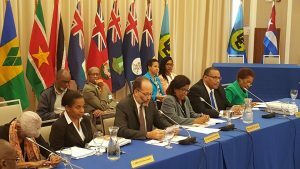 The Caricom Secretary General said the key is to find a mechanism such as a bilateral Caribbean-UK trade agreement that would allow for “a rollover of the trade with us on the same preferential access”. “It would amount to something like that. This is part of the technical discussions that is ongoing,” he said. La Rocque hoped that the Caribbean and the UK would be able to able to finalise a new trade arrangement to ensure “there is no break in the trade” between the two sides. The UK accounts for about 21 per cent of total Caribbean exports to the EU. For the purposes of the EPA, the Forum of Caribbean States includes the 14 independent member- states of Caricom and the Dominican Republic. By referendum, the UK decided to break away from the EU.